People’s time is precious, and what little time we do have together ought to be structured to meet real spiritual needs and ends. Without explaining what those needs and ends are, here’s how I would like to see Sunday church services. And I don’t mean just padded pews. Taking a cue from the informal and openness-inducing atmosphere of the many Buddhist meditation rooms I have been in, I would like us to remove our shoes at the front before entering the sanctuary. 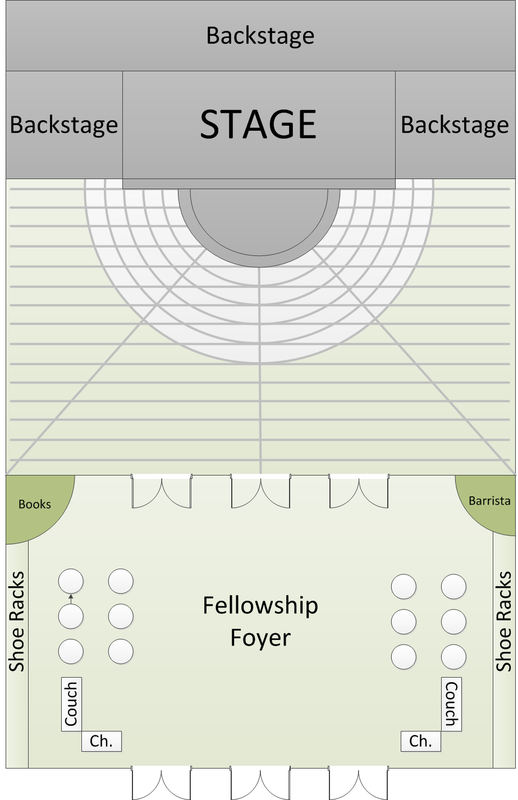 I would like the first half of the seating in the front be without chairs, but instead, provide zafus for those who could like to sit on the floor. 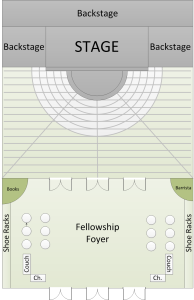 Now, I’m no architect, and I know there is a lot of great wisdom out there regarding church layouts, multipurpose rooms, room for expansion, etc. But the main idea in my drawing is the up front floor sitting area. Most contemporary churches have dynamic and beautiful worship, but lost in much of our modern living is silence. I would love to start the service on time, and for whomever is there, engage in 10 minutes of ‘guided’ silence – that is, someone up front guiding us into some silent appreciation. If you arrive late, you have to wait until this time is over before you come in. Sorry! Hey, why throw out the baby w/ the bathwater? This stuff is good if done well, and essential as a basic of Christian community. It gives people a chance to enjoy and experience spiritual community, at least in a superficial way (better than none!). Hopefully, it gives them enough of a taste to want to participate in the small groups. Many people have attempted to modify our church structures to meet the real spiritual needs and culture, I am certainly not the first. Doug Pagit’s Church Re-Imagined: The Spiritual Formation of People in Communities of Faith really inspired me to rethink the way we do things. So I am. In fact, my class next quarter in Fuller Theological Seminary is The Practice of Christian Community (syllabus), so I’m sure I’ll come back with more. Get ready!